When in the wild you need to protect yourself from harm, build shelter, split firewood, and do so much more. In such case, a dependable survival knife is arguably the most important piece of survival gear you can carry with you. It is important to understand the options available in order to choose the best survival knife for you. All brands and types of survival knives are not created equally, and there exists a wide variety from which to choose. Survival knives bear many important features, and the best one for you may be totally different from what works best for someone else. That is why it is important to learn about the important features they offer so that you can end up with the knife that best meets your needs and also fits in with your budget. When in the market for a survival knife, one should not take the decision lightly. When put to test, your life could be on the line. Choosing the best survival knife, and learning about its features could be one of the most important life-saving decisions you make as you prepare for the unknown. If you want to make the most out of your investment, it is important that you choose a survival knife carefully. Here are some features that you should consider. Survival knives come with a whole array of handle options. Popular handle choices include hard polymer, molded rubber, wood, specialty plastic, and even some hollow options. You will want to choose a knife handle that feels good in your hand, and that you can easily and comfortably grip. You will also want to consider how the handle material will perform when wet. Your hand should fit comfortably on the knife handle, without putting your fingers too close to the blade. Nowadays, it has also become popular for knife manufactures to build in additional features or even other survival gear into the knife itself. You may see options like compasses, tool kits, fire-starting material, and more. Hollow handle options may boast additional storage space for any such essentials. While the option to store things in your knife handle may sound very convenient, please keep in mind that by bundling these items together, you increase the chance of losing not one, but both of them. For example, if your fire-starting material is stored in your knife and the knife gets lost, you will have also lost your means of starting a fire. Most common materials for knife blades include Stainless Steel or Carbon Steel (usually powder-coated). Stainless Steel is very strong, stainless, and not highly susceptible to rust from moisture or humidity. It can also perform well without need for frequent maintenance, but stainless steel is also known to lose its razor sharp edge more quickly. Carbon Steel knives are commonly known to keep their sharpness longer than stainless steel knives, but they need regular cleaning and lubrication to avoid rust and damage, and are more susceptible to moisture and humidity. Straight and Serrated are the two most common blade options. Many prefer a serrated blade for its added abilities, but it is a matter of choice. Whichever you prefer, you will also want to be prepared for a means by which to sharpen your blade out in the elements. Straight blades are generally quicker to sharpen, and in an emergency situation, may even be sharpened with a stone found in nature. Serrated blades, however, pose a more difficult sharpening challenge. An important factor to consider is what size of survival knife can you comfortably and easily carry with you? For most outdoor enthusiast, a knife that is no more than ten inches is usually the best size to carry without concern of it being too heavy or bulky. A knife that is too large or hefty could easily become more trouble than it’s worth. The thickness of the blade is also important. The best knives fall in the middle ground – thick enough to tackle large tasks like chopping wood, but thin enough to handle tasks as fine as chopping vegetables, as well as many more tasks in between. Part of preparing for survival is also preparing for the unknown, so you should also be well-versed in the capabilities of your knife and you should test it out ahead of time, well before you might find yourself in a survival situation. There is no shortage of survival knives in the market which is why it can be tricky for first-time buyers. To help you out, we have compiled some of the best knives that will surely come in handy in most survival situations. The Schrade SCHF2 Survival Knife is a finely crafted tool like nothing else, synonymous with the quality for which Schrade is known, at an amazingly budget friendly price. The blade itself is made of Society of Automotive Engineers (SAE) 1070 high carbon gray steel, and also has a 1070 steel handle. With both blade and handle made from one piece of steel, this knife lacks a weak point where the handle is attached to the blade, as you would normally expect to find in a knife that has a hollow handle. As an added bonus, the end cap is attached with ten piece bits, and a bit holder made of aluminum. The nylon sheath of this knife is simply does not match up to the same standard of quality to which the knife itself is designed. It lacks a tight fit, and has a tendency to rattle, and is outfitted with a steel rectangular ring that doesn’t serve any purpose, perhaps other than being decorative. All in all, this is a fantastic, durable piece of equipment at an exceptional price. What we like about this knife is its sharp blades and waterproof end cap. It comes with a removable storage pouch and lanyard that makes it easy for you to carry. Also, there is no argument about the life of this knife as it can be with you for two lifetimes if taken good care of. 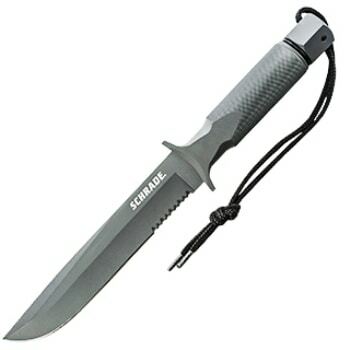 Related: The Schrade SCHF1SM is a high carbon steel drop point with water proof hollow handle that also comes with a removable storage pouch. The blade is 10.3 inch long and weighs somewhat around 0.81 pounds. When you buy this product, you also get a limited lifetime warranty that acts against all the manufacturing defects. There are a number of options for knives that use the combination of a carbon steel blade with powder coating, but the coating on most of the other brands wears off quickly and the blade is susceptible to scratching. Such is not the case with the ESEE Knives Laser Strike, and as long as it is properly and easily cared for with a little oil or dry film rust inhibitor, it will stay in prime, scratch free condition. This is a somewhat large, heavy knife, with a thicker blade and a finger grip designed in a manner that keeps your fingers away from the blade. It also has a convenient fire starting kit in the handle, however, this renders the knife not waterproof as the kit itself is not waterproof. The included Kydex shield is of a very good quality, and has an adjustable screw for controlling tension. This knife is an excellent option, and like all ESEE products, gives the buyer additional peace of mind in knowing that it bears an unbeatable warranty. Till the time, you are taking good care of the knife, like oiling on time, it is not going to corrode or chip, else it might get the signs of rust on it. If you get it broken by any chance, you can contact the provider and they will provide complete assistance. The service remains the same, even if you have transferred the knife to another user. 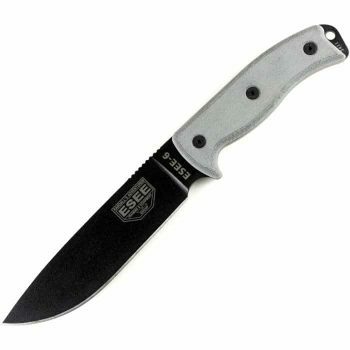 As mentioned in the review above, the ESEE 6P-B Plain Edge Survival Knife is yet another example of a carbon steel blade with a powder coating that holds up rather well if it is properly taken care of, cleaned and lubricated regularly to prevent rusting. This knife boasts a nearly six inch cutting edge, and the angle of the blade enables the knife to perform more delicate tasks as well as larger ones. The 1095 steel is nearly impossible to bend, and can stand up to your toughest tasks without fear of shattering or breaking it. 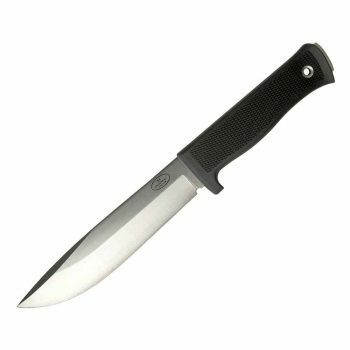 The molded polymer sheath is highly functional, as is the Micarta handle, which offers very good grip that performs extremely well even when wet. 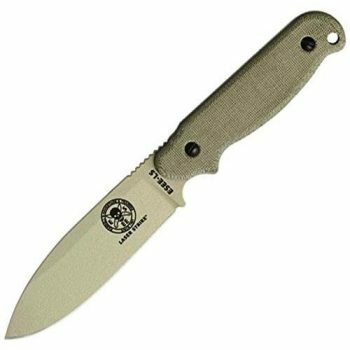 As also mentioned above, this knife from ESEE offers the buyer the added security in knowing that the outstanding warranty will have you covered in case it breaks. Taking it in your hand, you will feel a good grip and the knife works well even with gloves on. You will be able to have a better balance and sharp finish with this knife. Even the sheath that you get with this knife is outstanding and the belt clip offers positive attachment to your belt. Whether you are going out for hunting or camping, this is one great option. If comparing this knife to a less expensive one, it makes sense to pay more for the added peace of mind in knowing that it will serve you for years to come, possibly even for a lifetime. This knife is another fantastic option at a great price that will not disappoint. Related: People who buy this product also buy the ESEE Knives LSP Laser Strike because of its durability and reliability. The blade material is good enough to not chip away for two lifetimes. However, you need to take good care of it by greasing from time to time. Suited for campers, hunters, or anyone who spends significant time outdoors, the knife is uniquely designed for a wide variety of tasks, such as splitting wood for kindling, chiseling, skinning game, or even chopping vegetables. 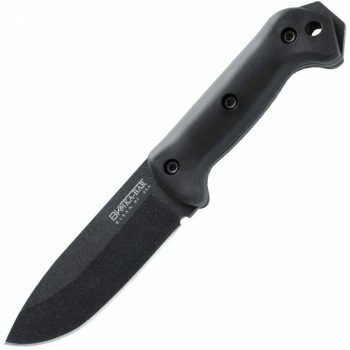 However, with a somewhat thicker blade this knife will most definitely feel more sturdy and substantial in your hand, and the Ka-Bar Becker BK2 is likely best suited for tougher tasks like chopping wood, cutting thick objects, or anything else for which you would think to use a hatchet. Many users report that they have struggled with using it for more delicate tasks due to how thick the blade is. It features an easy to grip, comfortable handle made from Grivory (a specialized plastic) and also includes a nylon sheath filled with glass to keep the blade sharp and safe until ready for use. Great for collectors and outdoor services, this knife has been tested for quality as well as durability. The 9 inch blade is chiseled with 20 degree edge angle works well in most of the heavy duty work. For such a moderate price, this one comes with a relatively great price. 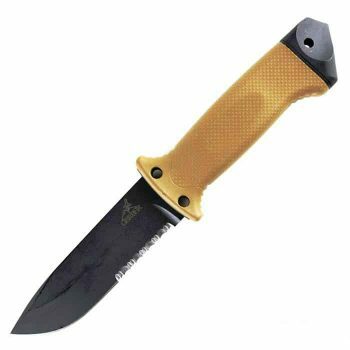 Related: Ka-Bar Becker BK9 is one of the most often bought product with this knife. You would be surprised to know that this very knife is being used all branches of military and service members. The Velcro on the handle ensures that the strap is in place so that the blade does not cut them during insertion or exertion. Although you can get many knives at a lower price than this one, you cannot even come close to finding anything that approaches the superb quality of this Fallkniven A1 Survival Knife. Constructed of laminated VG-10 steel, this knife comes razor sharp right out of the box, and it is very easy to maintain and less susceptible to the elements as carbon steel blades. With a blade that is nearly ¼ of an inch thick, it is very well suited for wood chopping and splitting, but has the sharp edge and precision to do so much more. The handle is made from Kraton, and handles well wet or dry, although users with larger hands may find that it is a little short for their liking. It also includes a Zytel sheath which is practical yet unremarkable in comparison to the fine and precise instrument it holds. The sheath has a drainage hole to let moisture out as the knife is carried. Owners who desire something more could easily have a custom leather sheath made to fit it. This knife is simply amazing, and performs beautifully and consistently with only minimal sharpening needs to keep it in pristine condition. Related: Those who buy this knife should also go for the Fallkniven Knives DC4 Diamond. This is a pretty slick whetstone that will surely keep your A1 at its sharpest. It comes with a handy leather case so you can take it with you anytime. The Gerber LMF II Survival Knife was designed to ensure survival even under the worst of conditions. Engineered by former military man Jeff Freeman, this rugged and reliable knife has been field-tested by troops to ensure that it will be up to the task in a variety of emergency situations, be it cut wood, build shelter, skin game, or anything else the situation demands. The blade is serrated, helping this knife to perform well under a variety of conditions. It also boasts a built in sharpener within the sheath, so you will never have to worry about finding yourself out in the wilderness stuck with a dull knife. The sheath also moves easily and can be attached to your belt or clothing. This knife also features an overmolded handle that will prevent blisters of your hand when you hold it tightly. The knife also displays a pointed buttcap which is made exclusively of stainless steel. This buttcap is designed in a way to offer shock absorption when you use in like a hammer. You can use the pointed ends to simply pierce the glass screen of a vehicle. The knife is designed to handle a ton of abuse and that makes it a perfect option for a survival knife. This is another great knife with a relatively low price tag. Related: People who buy this knife also buy the Gerber Prodigy Survival Knife. The knife is made up of 420HC stainless steel blade which comes with black oxide finish. It is going to include leg strap and two extra attachment strap to maintain the safety. As stated in the above review Gerber has been specially designing survival knives for the US Military since 1968. This Gerber StrongArm Survival Knife surely proves itself worthy to bear the Gerber name for a solid, dependable knife suited for combat and survival scenarios. It included a sheath that can be mounted, a fine edge, and a full tang blade with a black ceramic coating. This knife was designed to meet the specifications of military survival training. It has rubberized handle with a diamond texture for optimal grip. It also has a pommel at the base of the handle which can be used to break hard surfaces. Dry or wet, this one is not going to slip out of your hand; hence you can enjoy your chores to the most. Even the sheath of this knife is improved one and you can release the knife using the pressure of just one thumb. This is the most advantageous feature, when you want to do some quick jobs with your knife. The ceramic coating offers the blade protection from corrosion. Although there are certainly better knives on the market, we feel that this knife deserves a place on this list due to how functional and reliable it is, especially for the price. We have explained a lot about the important features to look for when choosing a survival knife. It is also important to test your survival knife before taking it with you on an adventure. No matter how well you understand the features and what your knife is designed to do, there is no better way to prepare yourself than to actually try it out ahead of time. This may also help you realize some additional accessories, precautions, or preparation you may need to do before you incorporate the knife into your regular gear. Hopefully this article has helped you feel more confident in choosing and testing a survival knife. We have explained seven different options we believe to be some of the best, and we have given you some helpful tips and ideas about what to expect. We would love to hear what your experience has been with survival knives. Which brands have you tried? What kind of emergency situation have you been in where your knife alone has saved your life? What are some of your favorite brands? Let us know by leaving a comment below!